We offer comfortable accommodation for the casual visitor and those who seek enjoyment from a variety of outdoor interests. 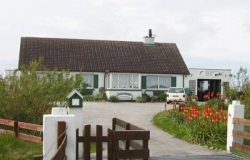 So if you are an angler looking for sound advice on all aspects of fishing in the Western Isles or a walker or bird watcher looking to get the most out of these beautiful and tranquil Islands, you'll find no better place to stay than the Angler's Retreat. "Fantastic time, plenty of lovely food, great hosts and brilliant fishing - over 50 trout! Many thanks." - B.C Boscombe, Dorset. "Many thanks for a lovely stay and all the local information. " - F.L California, USA.